ATi - ATi Dampers for Acura, Honda, Mitsubishi and others. ATI has designed a 5.5” damper — Part # 918476 — for the Honda B-Series for high horsepower street use. This new design is a direct replacement for the stock OEM Acura Integra B18 and Honda CRV B20 damper. The heart of this unit is the tried and true “damper within a damper” design that has put ATI ahead of the rest. The outer shell has been machined with the necessary multigroove pulleys to utilize the factory serpentine belt set-ups. The damper includes a removable serpentine style power steering pulley for ‘94 and newer B-Series applications, with the V-groove power steering pulley available upon request for the earlier B-Series applications. ATI has designed a 7.0in. 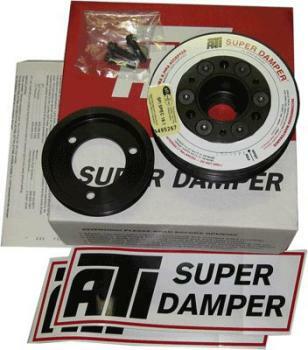 damper — # 918471 — for the Honda B-Series for high horsepower Race use. This new design is a direct replacement for the stock OEM Acura Integra B18 and Honda CRV B20 damper. The heart of this unit is the tried and true “damper within a damper” design that has put ATI ahead of the rest. The Alternator dirve is machined into the hub and there are NO provisions for A/C or Power steering.